When James Whitmore performed his celebrated rendition of Will Rogers at the Mark Taper Forum many years ago, he walked out on stage as himself and then with a few costume effects (cowboy hat on the back of his head, kerchief, lasso) became his character, earning a round of applause. After the intermission, the scattered members of the audience at this matinee were summoned down front as he said, “I’ve heard of wide open spaces, but this is ridickalous!” To this close-packed crowd, Whitmore played. Julius Shulman has the knack of appreciating the same situation for himself and enlivening a somewhat lackluster crowd. It’s Sunday afternoon, 10-15 people sit down in chairs before the tree with its circular bench under the skylight in the center of the ceiling to hear him speak. Many customers are in the store, and perhaps they don’t recognize him. Shulman is wearing a sport shirt of an indefinable Tyrian hue, and gray slacks. You are surprised at his youthfulness until the added years reveal themselves as a kind of added dimension. He’s talking about swimming pool ads in the old Los Angeles Times Home Magazine, superabundant they were, too many, even. Now he’s introduced, but he interrupts his own introduction. “I’m used to being rude. I don’t like introductions, especially when you read something.” This is said with such a good grace, or rather so matter-of-factly, the presenter is properly relieved. “People die too young. They try to make money.” His speech is not so much rapid as fluent and easy, and all these notes record are fragments. Is the proprietor of the Dresden Restaurant down the street still there? Yes. Over lunch, Shulman was asked to photograph the place. 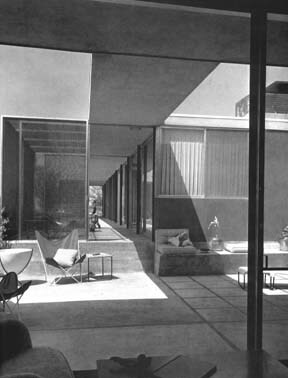 He became an architectural photographer after first spending seven years at university (five at UCLA, two at Berkeley), and then meeting Neutra. There was a great bookstore in West L.A. or Pacific Palisades, back in the Fifties or Sixties, it had (he remembers) a sitting room with a fireplace, and snacks. You could hang books from that tree. Like Christmas ornaments. He pronounces LACMA the way it looks, the way students and staff do. “Having a wrapper on a book is like inviting someone to your home and the door is locked.” Nancy Friedman of the Los Angeles County Museum of Art hands out copies of their new Shulman calendar, twelve photographs in a portfolio. You can cut off the calendar, Shulman points out. The pictures are absolutely perfect compositions (everything in them was arranged by the photographer, he says later in response to a question). $26. At university, he paid $25/mo. rent, and sold 8x10 prints for a dollar apiece in the campus bookstore. Next week is his 94th birthday. Modernism Rediscovered is sold out, a sequel is pending. His new book is on Malibu. Where does he live? On Woodrow Wilson Drive, Laurel Canyon near Mulholland. He’s evolved a system for avoiding the freeways, getting here today, for instance. “Julius Christ.” He photographed the new cathedral downtown and was chatting with Archbishop Mahoney about antagonisms among the various religions. The inner workings of the spirit are a very mysterious thing. He has a sense of the religious beyond antinomies. His favorite house? His own, which Raphael Soriano built for him and his wife in 1950. Soriano was a warm man and sympathetic to his client, suffering modifications and the like. The portfolio has The Rosewood (Charles Gault, 1929), an apartment building with a complex design and an open fireplace in the courtyard; Magnetic Drive (1935), a view of the Hollywood sign; Garbage Day (1935), demure cans on a well-kept street; Neutra’s Kaufman House (1947), a tour de force at evening; Albert Frey Residence, etc.